The bitter mote…of a soul? Ever since the first computers, there have always been ghosts in the machine. Random segments of code that have grouped together to form unexpected protocols. Unanticipated, these free radicals engender questions of free will, creativity, and even the nature of what we might call the soul. Why is it that when some robots are left in darkness, they will seek out the light? Why is it that when robots are stored in an empty space, they will group together, rather than stand alone? How do we explain this behavior? Random segments of code? Or is it something more? When does a perceptual schematic become consciousness? When does a difference engine become the search for truth? When does a personality simulation become the bitter mote… of a soul? As an architect, you have the power to control everything. As an architect, you lack the power to control anything. That is the lesson I am discovering on this leg of our journey through Hong Kong and Shenzhen. We have visited countless architecture works by architects from Ando to Ito to Koolhaas to Foster and yet, no matter how star-studded and acclaimed these architects may be, I argue that not a single one can design a building where they control every surface and every interaction that occurs within its realm. We encountered an unexpected programmatic use on the ground floor of Norman Foster’s Hongkong and Shanghai Bank on a Sunday (if you visit, it has to be a Sunday!). 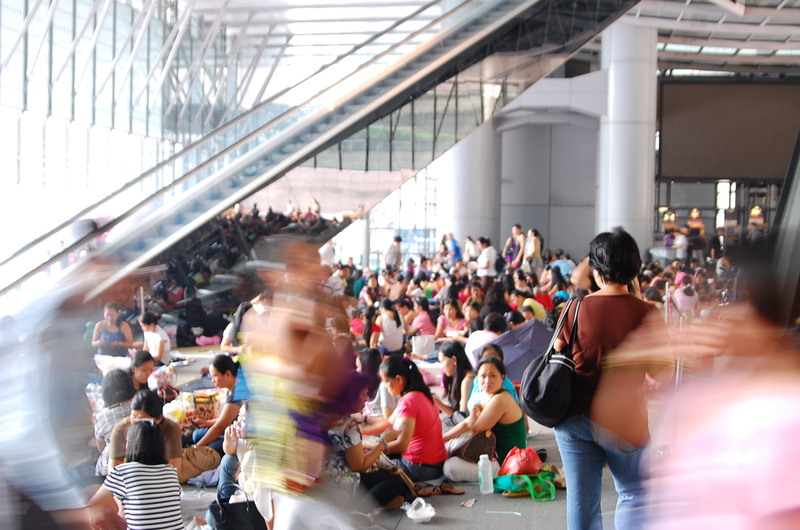 There, blanketing the ground floor that powerful bank executives cross everyday during the week, are hundreds of Filipino women and children, sitting down, playing cards, and taking in the Sunday relaxation. You could look around the grounds for a sign designating the area Sunday Picnic Space but you would never find it. I am reminded of the old architect mantra “build it and they will come.” No offense to Lord Foster, I do not believe he anticipated the use of his ground floor for leisure rather than business. Instead, we witness a fascinating parasitic weekly occurrence. The building acts as a “host” to the people, who utilize the space for short periods of during the week and then leave. What makes this phenomenon more prodigious is that something of this nature is seldom seen back in the States. The main operating principle of a parasite is that it feeds off of its hosts but never harms it. The ground floor is never left with trash or waste when Sunday ends. How many times has a parking lot outside of a stadium been left spotless after a day of tailgating? These types of conditions are more closely detailed in Junzo Kuroda’s Made in Tokyo: Guide Book. Kuroda’s guidebook chronicles various urban spatial situations throughout the city of Tokyo that are unique because of odd programmatic groupings. Kuroda labels these situations as Da-me architecture, or not the “architecture of architects.” He observes instances such as a highway department store, roller coaster building, and a graveyard tunnel that are a result of an organic city that breathes, consumes, and produces. As architects, we cannot ignore the fact that often times the city creates where architects or civil engineers do not. We must accept that the city evolves and morphs on its own. The film quote above is by a scientist discussing the artificial intelligence of robots and the possibility of a machine having a soul. Why is it that when [programs] are stored in an empty space, they will group together, rather than stand alone? I witnessed one instance of this along one stretch of street in Hong Kong. As we traveled on the tram, we passed dry-fruit stand after dry-fruit stand, all lined up next to each other. Then it would change to light store after light store. Groupings of similar program change as the fabric did. Is this by coincidence or the act of architect or engineer? Did the entire dry-fruit stand owner population get together and decide to post up their shops next to each other? Rather, there is anintelligence at work. An intelligence that seeks to counter the “void phobia,” as Kuroda describes it, that the city of Tokyo combats by filling every available space, even the smallest amount of space that can be filled by a vending machine. 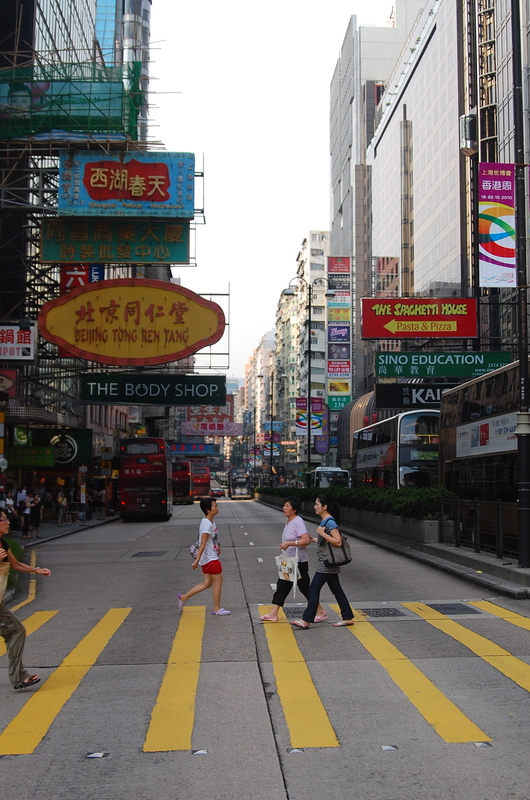 This void phobia exists over streets in Hong Kong, with signs stretching over and past one another, fighting to gain leverage over the other. This intelligence is everywhere. You only have to look.